apologies yet again for neglecting this blog. It has been, as they say, busy. Looking back over this year what have I done? I directed a one woman show written by Adam Z Robinson and performed by Rachel Ashwanden called Conscientious about bullying. One audience member said it had touched her soul and another said it was more straight forward than the Germans. That was nice. I was dramaturg on a production of Boi Boi is Dead by Zodwa Nyoni working with the phenomenal Lucian Msamati as director. That was hugely satisfying having started that play off on a young writer on attachment scheme I put Zodwa on in 2011. I revived the production of Nine Lives also by Zodwa performed by Lladel Bryant about a gay asylum seeker in Leeds and we’re taking that out on a tour around the country. I wrote a some successful funding applications for other people – including for Ramps on the Moon a project that I hope and believe will make much needed change in the employment and visibility of disabled people in the arts. Ok so enough of that. Thing is even when I put that all together and look at it and can say well yes that has been quite successful, it hasn’t always FELT that way. A lot of the time it has felt more like struggle, more like failure. I think many of us can relate to this – when other people look at what we are doing and say you are doing really well – but inside it just feels very hard. 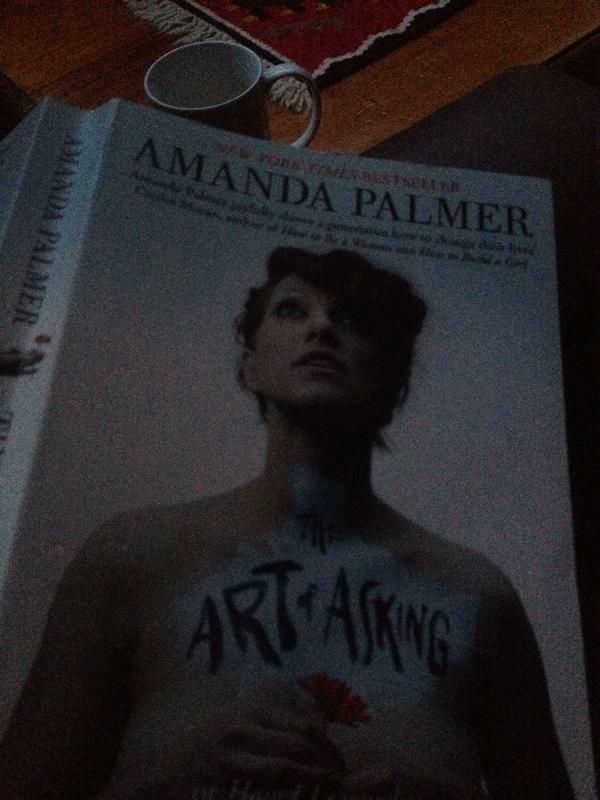 Amanda Palmer’s Art of Asking I STRONGLY recommend you read this book. Especially if you have anything to do with making, funding, performing art. It talks about many things but the point I want to pick up on today is: she talks about the Fraud Squad that lives in our head. The one that tells us we are not good enough, don’t deserve this, shouldn’t dare to call ourselves artists. I think if you are any kind of artist you need that voice in your head – questioning yourself is part of making the art. It gets to be a problem when those voices drown out all others. Those of us whose job it is to support others in the process (*friendly wave to directors, dramaturgs, stage managers and lots of others*), we spend a lot of time, maybe most of the time, enabling others to work with the Fraud Squad in their head. Making the questions and doubts useful ones, moving them aside when they are not useful, eventually letting them go. It is important that we also get support sometimes ourselves. For all the support that we give to others (and they in turn can pass on) has to come from somewhere. We all need our support structures, be that from friends, family, trusted colleagues or just our dog that never lets us down. So this is a message to say asking for help and support is as important as giving it. That it is the give and take that forms strong, real relationships in art and in life. Only don’t ask me to follow my own advice. Because I am utterly rubbish at it. This one is for you. You with your play sitting in your documents file. The one you wrote 5 years ago and has never seen the light of day. You with your three-quarters completed novel. You with a whole pile of poems you’ve never been able to share. It’s for you sitting there with your dream of playing Othello. Of being the new Jane Bond. Of opening a theatre. Of singing your own songs. Dreaming whatever is your dream. And this is the message. Never give up. Never Give Up. Because it hasn’t happened yet doesn’t mean it isn’t going to happen. At the moment I am dramaturg on a production of Boi Boi is Dead by Zodwa Nyoni. This is a play that started life in March 2011 – when Zodwa was a young writer on attachment at West Yorkshire Playhouse. She wrote a first draft and then nothing happened for nearly a year. I got back from maternity leave, we talked about it. Zodwa did some re-writes, and then continued to re-write as she did her MA is writing for Performance at Leeds Uni. And the likelihood is that is would remain an unproduced first play. But then at the end of 2013 I submitted the play and Zodwa for the Channel 4 Playwrights in Residence scheme. And the panel is their glorious, infinite wisdom loved the play. Indhu Rubasingham, Artistic Director of Tricycle Theatre in London, offered space if we wanted to do a reading. So in February 2014 that’s what happened, directed by the brilliant Lucian Msamati (then Artistic Director of Tiata Fahodzi), this was the first time these words had been spoken aloud by actors. The play has changed a lot from then. It is at least a third longer for starters. From that reading Tiata Fahodzi and West Yorkshire Playhouse decided to produce. Watford Palace Theatre (new home of Tiata Fahodzi) came in as a co-producer. There were many, many long and complex discussions about budgets and schedules and co-production agreements. All the things you don’t think about when you’re alone with your computer and these words spinning through your head. Now it is happening, opening at West Yorkshire Playhouse on 14 February. Four years almost to the day that it started in a cold ‘writers lock-in’ at The Hub in Holbeck, almost exactly one year from its first reading. And let me tell you this is fast. Really. I’ve known plays take eight, fourteen, twenty years to get to the stage. And sometimes the ink isn’t even dry from your printer and it’s on stage. But a longer journey is not necessarily a worse one. It gives you and it time to grow, to mature, to learn about the play you are making and what it has to do in the world. And your play, your dream isn’t necessarily going to go on the same journey, or arrive in the same place. Sometimes you just don’t get the dream you thought you were going to have. So you think you’re going to be playing Othello at the RSC but it actually is a fringe theatre, or community centre. If the work is good, and true and what you want to make in this world that is what matters. Because the audience that sees you at that community centre wouldn’t ever go to the RSC. And the kid who is inspired to be an actor (or a general, who knows) wouldn’t have had that experience any other way. You have made the work for them. For you. I have seen this happen. But none of it happens if you give up, let the world stop your dream, rather than you reshaping your dream and the world. Here’s a song by brilliant bunch of artists, musicians, writers, composers, activists. I’ve been lucky enough to work with a few of them. They are making their work on TV, radio, in theatres, community centres, museums, working men’s clubs, public spaces. And they’re making it with the same passion, care and integrity that they have always have. I crawled in the mud. But I never gave up. I never gave up. I crawled in the mud. But I never gave up. Because that’s what it can feel like sometimes. Some days, some months, some years you’re crawling through thick, sticky, heavy mud. Because no one else believes in you, because you didn’t get that job, that commission, because you’re ill, tired, poor, uninspired. But don’t give up. Where you get to may not be where you thought you were going. But keep believing in what you do, believe in what you want to make, make it for yourself and the audience that responds to your work – doesn’t matter if that’s one person or millions. And if you hold on to your dream, let it guide you, change it, adapt it, but still believe in it, it will take you places, give you things you didn’t know were possible.